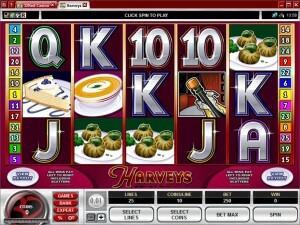 Harveys might be a culinary themed slot machine, but it’s not your typical game of this type. It has some lovely features you can hang on to, but it’s also themed around a high class restaurant, the kind of place where you can go and order a nice plate of snails, or some other plate of food that is beautifully decorated and just as tasty. 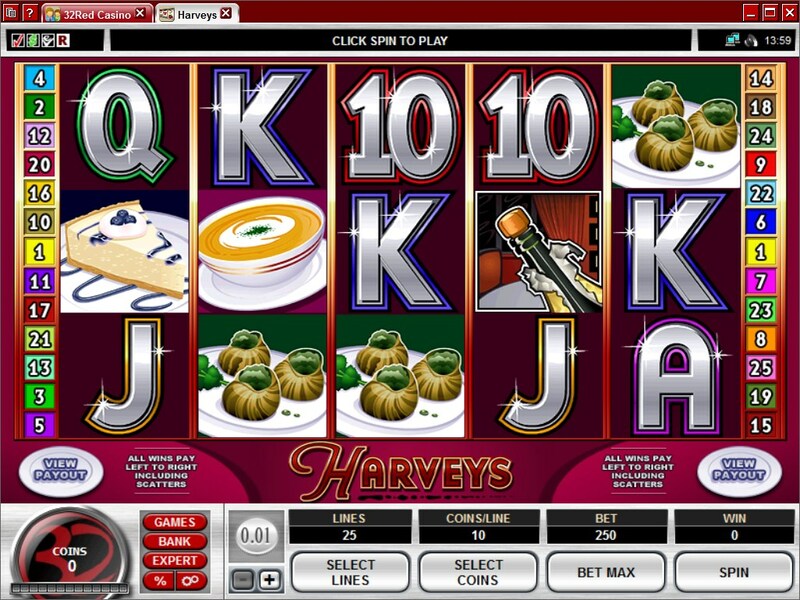 In most cases, food themed slots focus more on the Chef or on regular types of food, but Harveys tries to bring a bit of class to the experience. Microgaming is the creator of this slot machine. There is plenty of action that takes place on the game’s 5 reels & 25 paylines, especially since the gorgeous looking plates of food are accompanied by wild symbols, two types of scatters and free spins with some of the highest multipliers you will see anywhere. The base game jackpot is at $10,000. The game’s features can be quite impressive, and I’m talking here mostly about the multipliers and the free spins, though the scatter and the wild are good as well. First of all, we have Harvey. It’s a white guy in a white shirt, smiling for his customers. Acting as the wild, this symbol is going to replace any regular icon in a combo, but first it has to land on the payline where its help is needed, and in the right position. Obviously, a matching icon would work just as well, but if you don’t have that the wild symbol is the next best thing. Each symbol is present on multiple paylines, so there is a decent chance that it will be able to help out at least once when it appears. There are cases when the wild symbol appears multiple times on the same line, and if that happens you can get its own combo to form up, and it will be the most rewarding symbol of the slot. Up to 2,000x is won this way, with up to 5 Harvey wilds together. The scatter symbol is also present, like it is in many other slots. It will award prizes to you, nothing more, but it will do it with symbols that are randomly scattered on the reels, so you no longer have to form a combo to get the prize. 2x to 100x is the amount you can win, the multiplier being used together with the total value of the bet. 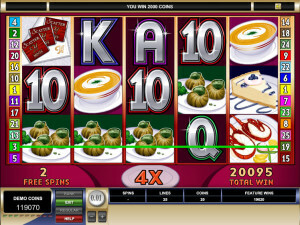 The free spins have their own symbol to trigger them, a scatter with an image of a Champagne bottle on it, required on the 2nd and 4th reels at the same time. 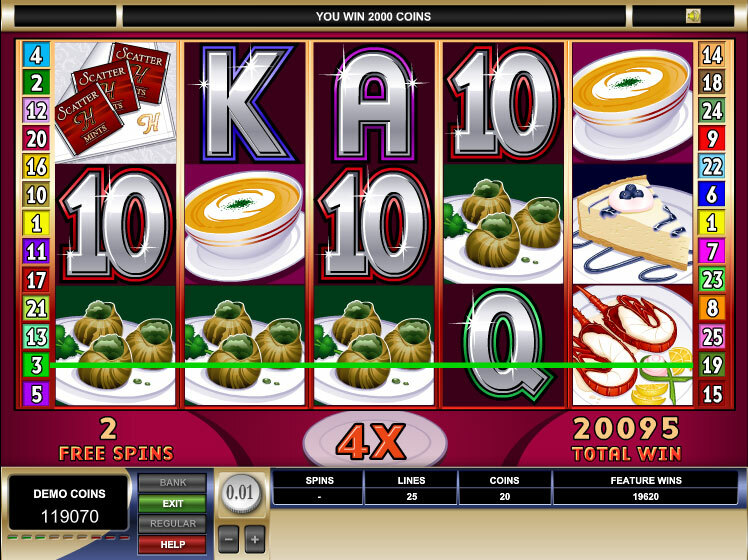 This feature can bring you up to 30 spins for free, while multipliers can go to 25x. That multiplier is the one that interests me most, as I rarely see games going that high. It gets even better though, as these spins can be retriggered. This is the kind of game that will use a lot of coins, 500 being part of the maximum bet, but thanks to a small coin denomination the wagers are not that bad. You use 1 to 20 coins on a payline, and the denomination goes from $0.01 to $0.20. The line bet only goes up to $4, while the total is $100 for all 25 lines. The most that you can get from Harveys is 2,000x with the help of the wild, which is about $8,000 cash. The scatter symbol does better, offering 100x the bet, or up to $10,000. The free spins are the most impressive though, adding to the mix multipliers of up to 25x, which could turn the jackpot into a life changing prize. 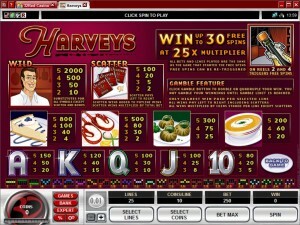 The high class atmosphere of the restaurant called Harveys is seen in the game’s design as well, which uses an attractive combination of dark reds, along with the pictures of fancy food. Unfortunately, they also use some rather unimpressive playing cards, which definitely don’t look high class. The game doesn’t look like some kind of masterpiece, but it’s a decent slot machine nonetheless. Symbols: Harvey (2,000x, wild), Dinner Mints (100x total bet, scatter), Champagne (scatter), Dessert (800x), Crayfish (500x), Snails (300x), Soup (200x), Ace (150x), King (120x), Queen (100x), Jack (100x) and 10 (80x). The theme isn’t completely original, but the high class restaurant niche isn’t that often used by developers. The design could’ve been a lot better, it’s not quite as luxurious as I would’ve wanted. The best thing about it would be the 25x multipliers that can be obtained during the free games. This Harveys slot is offered by all online casinos with Microgaming software, playable either in practice or in real money mode.